A local baker is taking her previously nomadic business to the next level. Opening in the space that last housed Cali Street Tacos in San Diego's Bird Rock community is Wayfarer Bread & Pastry, a neighborhood bakery and sandwich shop debuting this Summer. Wayfarer Bread is a bakery concept from founder Crystal White, who grew up in Napa, CA and determined from a young age that baking was her calling. For 16 years she has honed her baking skills by working her way up through various kitchens. In 2010, Crystal co-founded Proof Bakery in Los Angeles and, most recently, worked in the bread department at the world-class Tartine Bakery in San Francisco. Crystal just finished a KickStarter campaign that raised nearly $30k so that she could take her roving bakery into its first brick & mortar space. 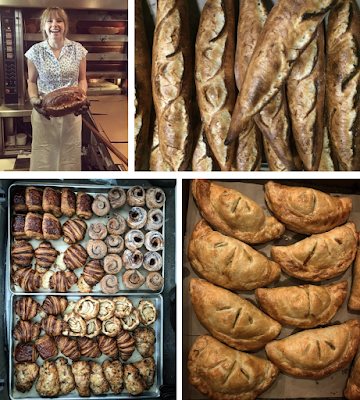 Wayfarer Bread & Pastry will be a quaint neighborhood bakery and eatery centered around a menu of naturally fermented breads made in small batches using locally sourced ingredients. Although bread is the specialty, Wayfarer will also offer a lineup of pastries, as well as a menu of fresh-bread sandwiches. Wayfarer is also in the process of seeking a liquor license so that it can sell beer and wine. Wayfarer Bread & Pastry is anticipated to open at 5525 La Jolla Boulevard in Bird Rock by early Summer. In the meantime, find them at OB Beans in Ocean Beach on Fridays from 7am till noon and Ironsmith Coffee Roasters on Sundays from 7am til 4pm. For more information, visit wayfarerbread.com.